I know it has been quiet on the blog — because I have been perfecting the book manuscript! I’m proud to say that the book — covering the Home Savings art and architecture commissions from the 1950s to the 1990s, and the entire scope of Millard Sheets’s public and commercial art and architecture commissions — will be published by the University of Texas Press in the first half of 2018, with 150 color illustrations. I will post the exact title, cover art, and pre-order information when they are available. I enjoyed speaking at Palm Springs Modernism Week about the project, and I plan to speak in many locations about it in 2018. 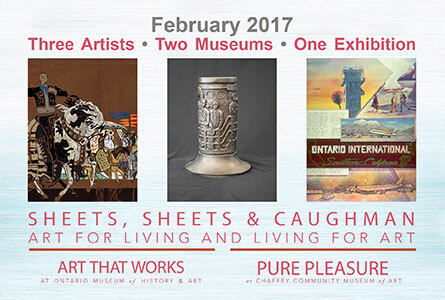 As for right now, be sure to catch the exhibition on Millard Sheets, Tony Sheets, and Rick Caughman at the Ontario Museum of Art and the Chaffey Community Museum of Art, through March 26.